The annual Christmas walk usually has a large turnout. Unfortunately, the weather did not live up to the fantastically cold and clear conditions we’d had the two previous weekends, and the forecast encouraged a few people to either join us for the meal only, or abandon the idea altogether. Undaunted, 25 of us still congregated at Hungerford station (Simon P turning up on the right day this year) and set off towards the common in the drizzle, almost managing to leave Richard S and his green wellies behind. 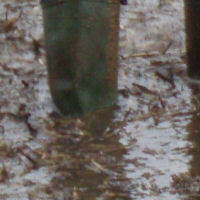 Those wellies turned out to be a sensible move. 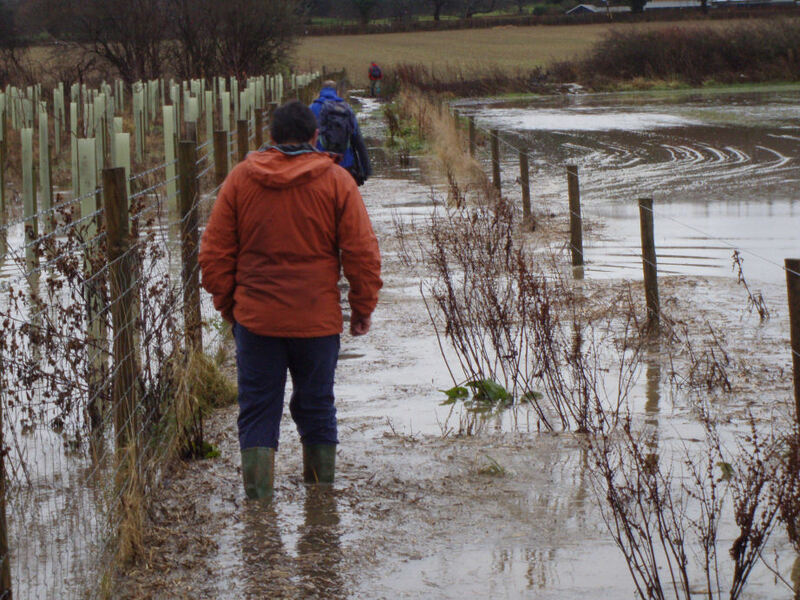 Dan had pre-walked the route and described it as muddy, requiring gaiters. However, the recent deluge of rain had added a lot of standing water and while it was fun to splash through a few large puddles, we were all brought up short by a path several feet underwater, ending in a bridge which had almost been obscured by the stream now rushing both under and over it. Some took a deep breath and waded in; others chose to skirt round the newly-made lake by detouring halfway across a field. It was while we were spread out negotiating our routes that Keyna missed her footing on the bridge and went into the water. At first, it didn’t seem to be a major problem. There was one of those ironic cheers, and Dan leaned over to give her a hand, figuring it would be easy enough to extract one small Australian from a stream. When he was nearly dragged in himself and Keyna’s head went under, the rescue mission became a lot more serious. The stream’s current had trapped her legs parallel under the bridge, and no amount of pulling or human chain-forming seemed to be having any effect – until Dave H leaped into the water, which came up to his chest, and managed to free her legs so that Mick could finally yank her from the water. Once the immediate danger had passed and we were all trying to process what had just happened, the women in the group efficiently formed a human wall around Keyna so she could get rid of her wet clothes and re-attire herself in a variety of spare clothing provided by the group. (It was almost an hour later when she asked “Whose trousers am I wearing?”) There was also hot coffee for Keyna and restorative mulled wine for the rest of us. 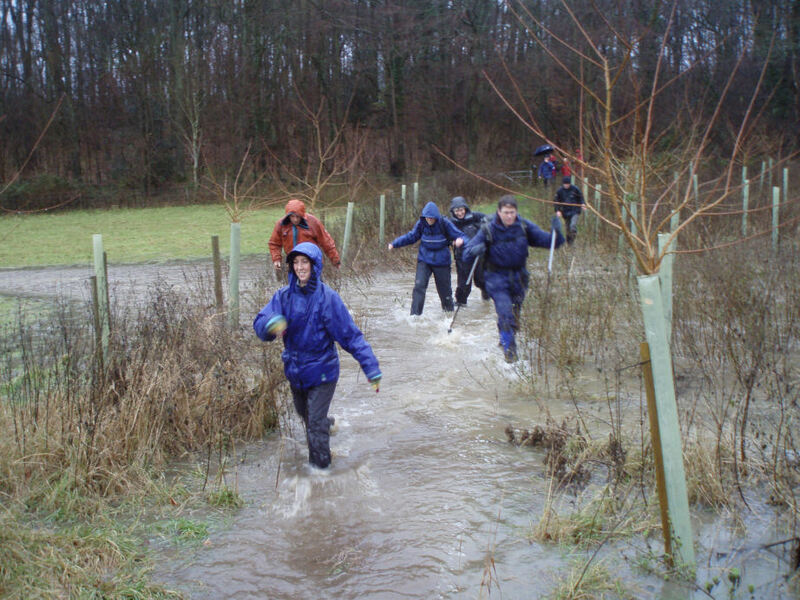 Eventually we continued to the Indigo Palace at Ham, encountering another water obstacle just to ensure everyone had wet feet, where Beckie and Fiona had brought along dry clothing for the others who had gone in the river during the rescue (Dave, Bruce and Dan). The Indian food was excellent as ever, but our late arrival and the large group meant that not only would we be finishing the second part of the walk in the dark, we’d be starting in the dark as well. Out came the head torches as we left Ham, and care had to be taken to keep the group together so as not to miss any turnings. The section through the woods was truly pitch-black. Eventually, however, we got to Bedwyn in plenty of time to finish off the mulled wine before catching the train back to Newbury. A few people went straight from the station to the King Charles and finished off the day with a few more beers, not to mention discussing the Incident of the Day. Considering we scale peaks, undertake exposed scrambles and rope ourselves to sheer rock faces, it’s rather sobering to encounter our most dangerous situation for years just outside Hungerford. 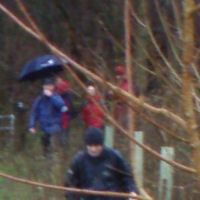 Everyone was OK and there were no serious consequences, thank goodness, but it was certainly a Christmas walk to remember.